When Joe went down into the basement of his girlfriend’s house to repair a leaking pipe, he would have never guessed that within hours he would be at The Conservation Center’s doors with a striking, but severely deteriorated, painting of Superman in hand. It was wet, stained, moldy, and even had insects living behind the frame. Fortunately, The Center’s team was at the ready to stop this kryptonite before it could do its worst. 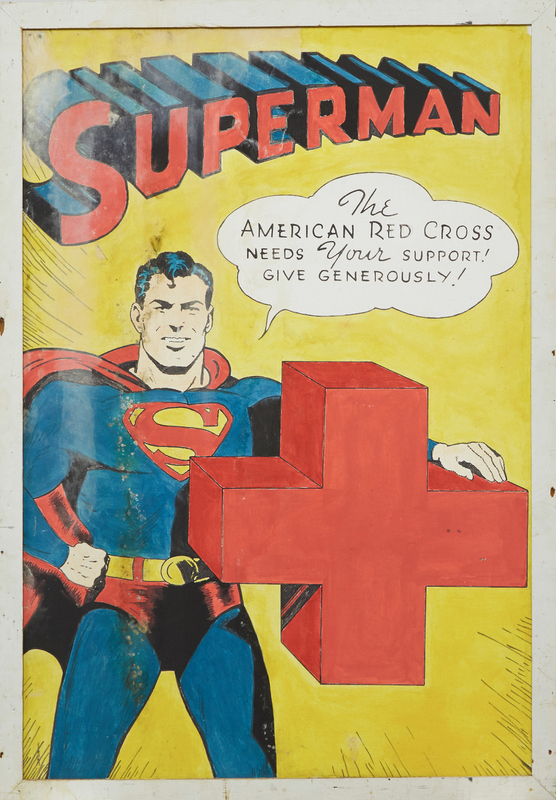 Found in a basement, the owner knows little about the origins of this unsigned painting of Superman featuring The American Red Cross logo. A bright, bold, and large-scale image at 60 x 42 inches, it is easy to see how it caught Joe’s eye that day. “When I got down [to the basement] I was in awe of the painting that seemed to come to life when I saw it.” The image of Superman with the iconic logo for the The American Red Cross is certainly distinct, and research soon revealed the origin of the image; it is a DC Comics Superman cover from May of 1945, issued mere months before the end of World War II. The cover was one of many comic book images used during WWII that combined a beloved character with messaging in support of the war effort. Featuring cover art by Jack Burnley, Superman No. 34 from May 1945 was one of the last covers featuring a war-related theme. Once the painting was dry after successful removal of the wet wood strainer the remaining wood paneling on which the canvas was adhered was treated to discourage any future mold growth. With the structure of the painting now stabilized, attention turned to the right side of the painting which had suffered notable stains in the image of Superman, running the entire length of the painting. While the stains could not be removed, they could be visually reduced with the application of conservation-grade paint that had been carefully color-matched and inpainted on top of an isolating layer of varnish. Senior conservator Amber Schabdach in-painting using reversible conservation paints to address the mold stains. On the left, the mold and water staining is evident pre-treatment. On the right, the staining is almost undetectable after inpainting. Now housed in a new frame specially designed and hand-made by the conservators here at The Center, Superman’s heroic stance is no longer impeded by the mold, water, and stains that had made their mark on this impactful artwork. While the origin of this painting and its artist remain part of the mystery, it is wonderful to see it back to its bold origins. As Joe noted, when he first saw the painting, he “just wanted to save a little bit of history,” and indeed with the team of conservator’s at The Conservation Center, he was able to do just that. Rid of mold and water damage, the painting is now ready to be enjoyed. The mystery of its origins remain; it is contemporary to the comic cover release in 1945? Or a later homage by a dedicated fan? Please reach out to The Center if you have any special insights - our client would love to find out more!